Dr. Carey is a respected practicing pediatrician in Ventura, California. He hosts Dr. Carey’s Baby Care on CAPS-TV in Ventura and other public broadcasting stations nationwide. He self-published a comprehensive review series for medical students and has written articles for Ventura Parent Magazine. He serves as a guest speaker for numerous expectant parent classes. Dr. Carey is known for his relaxed and fun attitude, good bedside manner and for always taking his patient’s concerns seriously. He has a deep love for the children he cares for. The creation of his first book will help you get through all the hiccups of your baby’s first year. Each child is different and even experienced parents can have issues arise that they have never seen before. It is nice to have a quick, easy to read reference right there if/when I need it! There are so many topics covered in this book that I needed to reference this time around and it's good to know that I wasn't alone and that they were ALL common issues that can arise. With over 120 full color pictures and less than 80 pages, "Dr. Carey's Baby Care: First Year Baby Care Guide" shares baby care as if you were in Dr. Carey's pediatric office. It's easy to understand to ease your concerns and eliminate those sleepless nights. 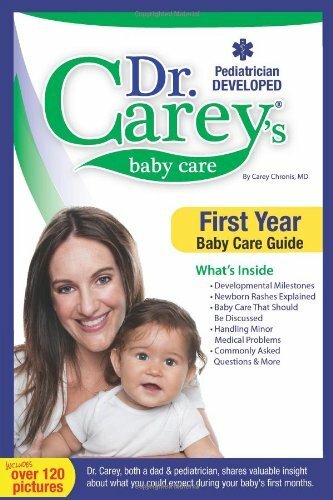 "Dr. Carey’s Baby Care: First Year Baby Care Guide" will provide essential baby care knowledge and a better understanding of when your baby needs to be seen by a professional, so you have the confidence to be an outstanding parent to your baby. 1. Development – Look at What My Baby Did! Let’s take a journey together and learn the nuances of development. You’ll know what to expect from your baby’s stages before these wonderful moments pass you by in a blink. Explained: Newborn Reflexes, Rooting and Sucking Reflex, Hand and Foot Grasp, Fencing Reflex, Startle Reflex, Positive Support Reflex Development by Age, and One Month to One Year. 2. Rashes, Rashes, Rashes – Newborn Rashes Explained. Colorful photographs bring to life a myriad of common newborn rashes to help you name and treat (if needed) these irritations: Salmon Patch, Acne, Heat Rash, Sucking Blister, Milia, Sebaceous Glands, Mottled, Erythema Toxicum Neonatorum, Peeling, Mongolian Spot, Gum Cysts, Epstein Pearl, Skin Tags, Conjunctival Hemorrhage, and Hemangioma. 3. Baby Care That Nobody Talks About – Common Baby Issues Explained. From umbilical cord care to basic questions about your baby’s private area, here are the answers with photographs to questions we sometimes feel shy about asking: Bundling, Umbilical Cord Care, Circumcision, Adhesion After Circumcision, and Newborn Vaginal Discharge. 4. Those Messy Diapers – Is This Normal? Be thankful this is not a scratch-and-sniff book. Dr. Carey will dispose of your poop questions before too many pile up: Meconium, Bottle-fed Diaper, Breast-fed Diaper, and Urate Crystals. 5. Minor Medical Problems – Simple Solutions to Common Problems. Here are the photographs that make Doctor Mom even more of an expert. It that diaper rash just irritation or from yeast? Why is your baby’s eye goopy? Is that thrush in the mouth? Clear color photographs and a concise explanation will guide you through the most frequently asked medical baby care questions: Diaper Rashes, Irritant Contact Diaper Dermatitis, Candial Diaper Dermatitis, Bacterial Diaper Dermatitis, Seborrhea, Thrush, Blocked Tear Duct, Umbilical Granuloma, Umbilical Hernia, and Caput Succedaneum. 6. The Sick Baby – When to be Concerned. Whether comforting a baby with a runny nose or tending to a fever, Dr. Carey offers practical suggestions for determining when you should seek expert attention from your baby’s doctor: Common Cold, Nasal Suctioning, Fever, and Urinating. 7. Since You Asked – Simple Answers to Common Questions. From eating and sleeping to teething and colic, Dr. Carey shares practical explanations to your common questions: States of a Baby, Feeding, Sleeping, Colic, Pacifiers, Hiccups, Teething, Traveling, and Newborn & Two-Year-Old. 8. My Baby’s Milestones – Follow Your Baby’s Development. What do you think is important to know that first year? The baby care that nobody talks about is the most important topic to me! This is a very good book. My sister needs this book for my nephew. I need to get this and give it to her at her baby shower. She could read it and get help. sounds like a great book. my sister just had a baby and this would be great for her. maybe i will pick it up for her.